UC Police Move in on "Occupy the Farm"
UC police moved in on the Occupy the Farm protesters Wednesday morning, but didn't call their actions a raid, rather, an effort to move anyone not authorized to be on campus property off the farmland in Albany. Starting about 7:30 a.m., police set up concrete blocks to prevent non-university cars from entering the property. Protesters had set up illegal encampments there in a dispute over the university's farming practices. A police lieutenant told NBC Bay Area "This is not a raid. No order to disperse was given." Police were only poised to arrest those who drove onto the property unauthorized. An NBC Bay Area helicopter over the scene at Marin and San Pablo avenues showed a calm scene with civilians walking around calmly about 7:30 a.m. About 8 a.m., UC police started setting up concrete barricades to block vehicle access to the property. Those barricades were the only real difference between Tuesday and Wednesday's farming efforts after everything calmed down mid-morning. 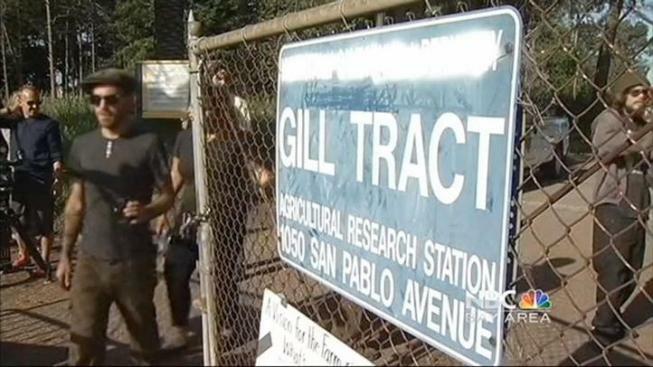 The area has been nicknamed "Occupy the Farm," and is a piece of property owned by UC Berkeley. It is a campus agricultural research field, and the Occupy movement, which opposes "agribusiness," also opposes some of the research activities and farming practices there. The protesters want the site to be used as a community garden. The university wants the Occupy-ers to stop camping without permission on the property. Wednesday afternoon it took things a step further and filed a lawsuit against 14 of the occupiers, demanding that they leave the property and reimburse the university for legal costs. UC spokesman Dan Mogoluf said there is a "plan on the table," which would allow urban gardening and university research to continue. In a statement issued Tuesday, UC Berkeley stated that university leaders had sat down with the protesters, and they "discussed steps that would allow for a "peaceful end to the illegal occupation." To read the statement, click here. To read more about Occupy the Farm, click here.